In the spirit of conservation, QUE minimized the number of trees cut down to publish this detailed book. Parts VII through X/chapters 24 through 33 and the appendices (in green-colored type) aren’t printed. Instead, they’re included in the PDF file that you can download (along with the sample code) from QUE Publishing’s Web site when you register your book. 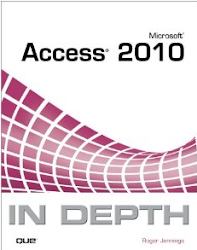 Electronic-only chapters cover less-widely-used technologies and those deprecated by Microsoft, such as VBA in favor of Access macros. The PDF includes all the book’s text and illustrations. QUE also helps conserve your cash: The US list and Amazon prices for this edition are US$39.99 and US$26.99; previous editions were US$49.99 and US$31.99. Alternatively, you can purchase the ePub version of the book, which works with all popular eBook readers. Details will follow.